Jandana Ranch is a family owned horse ranch nestled in the mountains 30 minutes northeast of Kamloops at beautiful Pinantan Lake. We are in our 28th very busy year! Book your holiday at our beautiful ranch now. Prepare to be pleasantly surprised! 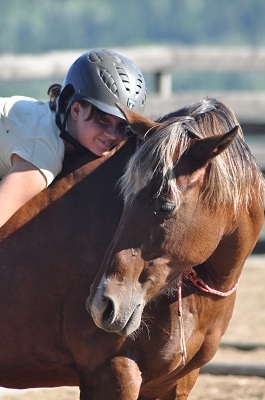 Jandana provides a special BC Guest Ranch experience for families, horse enthusiasts and non riders alike. What's New? New Events on our Calendar! Alpaca fibre from Coco and Cisco is ready for sale! Raw fleece, beautiful rovings, yarn and fibre for felting. I also have some beautiful Mohair from our own 3 goats. Enquire! Also some hand spun alpaca. AND! Dog! Gift Certificates : Mini rides, lessons, accommodation. We can help with ideas. Jewlia and Dolly, true partnership.